I ran with carry-on suitcase stuffed with Marantz & gear, big box for Tidewater Books under one arm, broken lapdog bag in front and daypack on my back. Had doubts I'd actually catch the bus to Moncton but there was a long line of mostly university students to buy tickets and the buses waited. I still didn't have a place to kip. 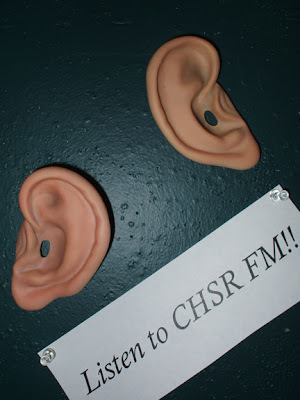 Was a small comedy of confusion in the Frye admin office in the Delta Beausejour. Phone calls to Rayanne and a search through every cardboard box under the table and against the walls before they found my media pass in a bundle tucked behind the curtains. First, I went to Mexi's on rue Main to catch the end of the WFNB reading. Came in during Partick Lane's reading . . . unexpected but great. Also caught Noeline Bridge, Edward Gates pictured above reading from Heart's Cupboard (Broken Jaw Press), and Kelly Cooper reading from a novel manuscript. Sat with Elaine Amyot, El Lemonde, Nancy Schofield, Lee Thompson and a later very-surprised Kimberly Gautreau. After a little discussion amongst them I ended up going with Kimberly to her place, a mattress in the attic studio in renovation. It's great. 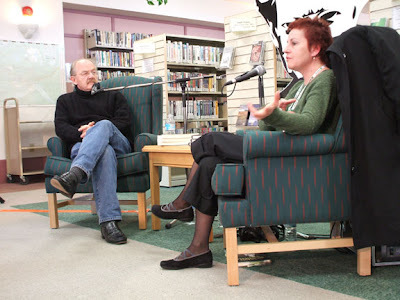 After some great vegie pizza at Calactus, we went to the Moncton Public Library for the Dialogue between Patrick Lane and Bernice Eisenstein on writing memoirs. Recorded it for APB and have promised to send copies to both authors. At the Soirée Frye in the Capitol Theatre I sat at the back beside the sound board with a direct line out of the board. The musical highlight was a first-every collaborative performance by Les Paiens and Isaac & Blewett (pictured above). Great readings too, though brief, by Bryan Perro, Karen Soile, Marilyn Lerch and Georgette LeBlanc. 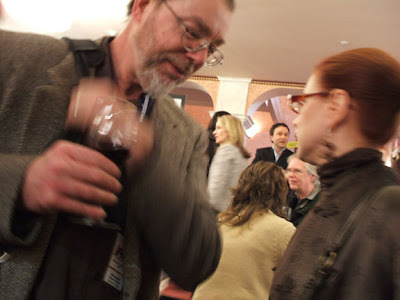 Up close pic of Ed Lemond and Kimberly Gautreau during the reception after the soirée. Wine, cheese and much fresh fruit to gnosh. 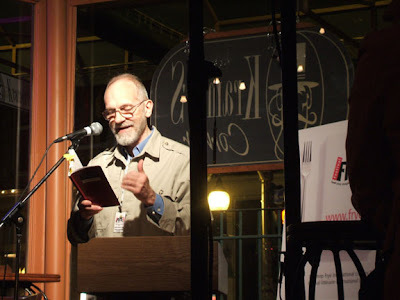 Went to the Night Howl, emceed by Paul Bosse, festival poet laureate. 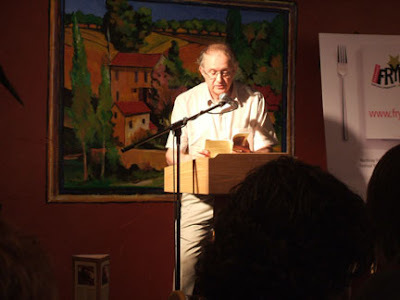 Pic above is of the very generous George Fetherling reading from his Selected Poems. First time I've seen him since he was writer in residence at UNB several years ago. 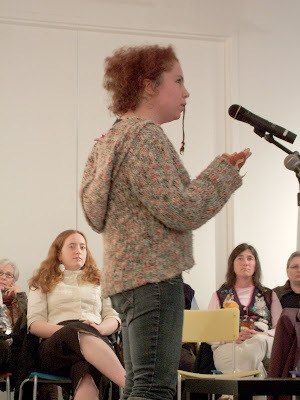 I covered up my media pass and read three poems to close the poetry component of the Night Howl. Was great to be asked to be a poet and to read my work. Then I walked to Kimberly's house. Talked and then journalled until 2:30 AM. Is is my distorted perception or did I suddenly get busier with everthing as soon as I decided to resume doing live episodes of Ashes, Paper & Beans on CHSR? 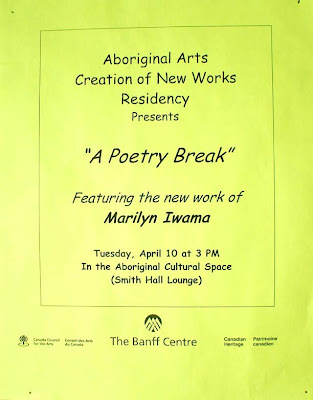  Marilyn Iwama's "A Poetry Break" reading of 10 April '07 @ Smith Hall, The Banff Centre. 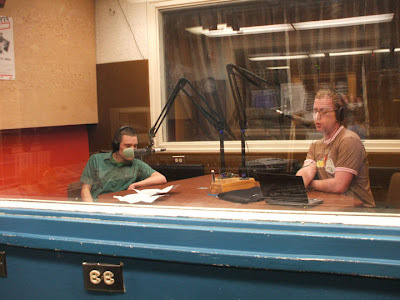 Matt (left, behind the big windsocked mic) and Carson (right, reading into mic) in the "fishbowl" studio @ CHSRJoe Blades photo. Today, Sunday, 22 April, the Festival ends. My unexpected roadtrip almost done. I'm to fly east @ 7:15 Monday morning. There were goodbyes throughout today and in recent days as the [SWAN] participants and CISWF performers depart . . .
Today's festival closing reading took place in the Art Gallery of Calgary (where I contributed to the Zine Scene exhibition in 2001). Today's exhibition is Pink featuring four artists Colleen Wolstenholme with Icon; Amanda Schoppel wuith Growth; Kristi Malakoff with Glade; and Glenda Leon with Libido. I've known Colleen since our NSCAD days. The pic above is a closeup of some of her work (including "Daisy"). 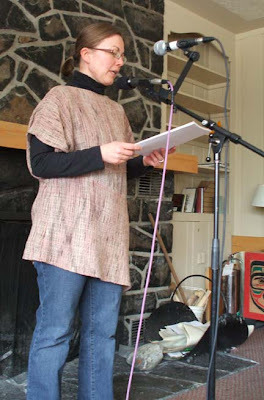 Wendy Morton, Victoria, BC, poet and coordinator of the annual Canada-wide Random Acts of Poetry. 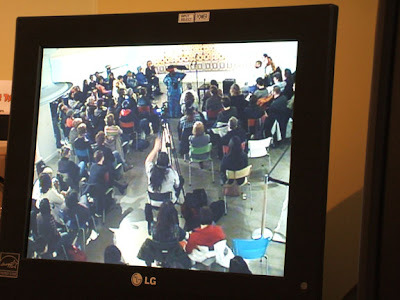 A view of Orunamamu's storytelling off the seceurity cameras' monitor in the AGC lobby. She lives in San Francisco. Us [SWAN]s captured by the Banff Centre's photographer. Back row, L-R: Klyde Broox (Hamilton, ON), Mike Roberts (Calgary), R.C. Weslowski (Vancouver), Fortner Anderson (Montreal), Ian Ferrier (Montreal), Billeh Nickerson (Vancouver), Sarah Bernath (Banff Centre). Middle row, L-R: Sean McGarragle (Vancouver), Andrea Thompson (Toronto), Sheri-D Wilson (Calgary), Ivan E. Coyote (Vancouver), cheryl l'hirondelle (Vancouver), D. Kimm (Montréal). Front row, L-R: Christie Rall (Banff Centre), Hilary Peach (Gabriola Island, BC), T.L. Cowan (Edmonton), Joe Blades (Fredericton, NB). Missing: Darek Dawda (Winnipeg), Dwayne Morgan (Toronto), Kevin Matthews (Ottawa). 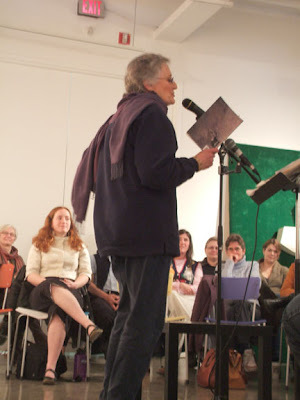 The Acorn-Plantos Award for People's Poetry is presented annually to a Canadian poet based on a book published in the previous calendar year (in the present case, 2006). The work should follow in the tradition of Acorn, Livesay, Purdy, Plantos, and others by being accessible to all people in its use of language and image. The award is open to any living poet who is a Canadian citizen or landed immigrant. The work may be entered by the poet or the publisher. The award itself honours the poet. The award consists of $500 (Canadian) and a medallion. In every residence room here, as in most hotel rooms, there is a package of letterhead and envelopes. 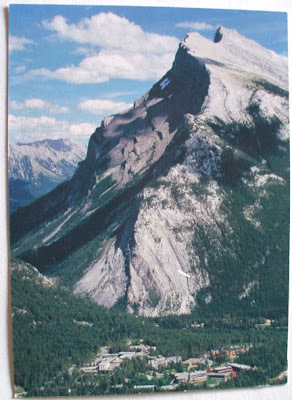 Above is a pic of the Banff Centre postcard therein included. An oblique aerial view showing the campus of the Banff Centre on the slope of Tunnel Mountain against the backdrop of the significantly larger Mount Rundle with its 12-km long ridged peak. Pic from the [SWAN] Spoken Word Artists Network Summit meeting yesterday. Ivan E. Coyote and T.L. Cowan viewed between amongst the table's population. T-shirt: Ruminator . 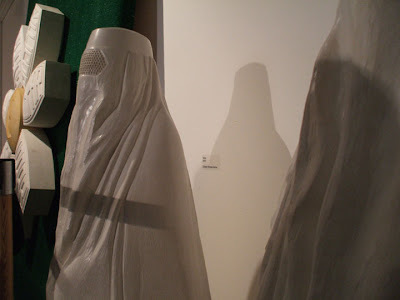 . .
Is it an art form, or forum, or arts practice? Where is spoken word art situated on the spectrum of literary and performing arts? Perhaps, it’s something like trying to pin down wind. One can see the effects of wind from sculpted snow and sand dunes to toppled trees and goosebumps on yours arms. One artist will be a storyteller unaccompanied, or with a deerhide drum. Another performs with a turntableist spinning and scratching vinyl platters to build their soundscape. Yet another appears in costume, in character, similar to an actor delivering a monologue on stage. The next performs with the reggæ-stylin’s of live musicians . . . or elements of stand-up comedy, a crew of graffiti artists, soapbox evangelism, street theatre, guerrilla art, a multichannel universe . . . 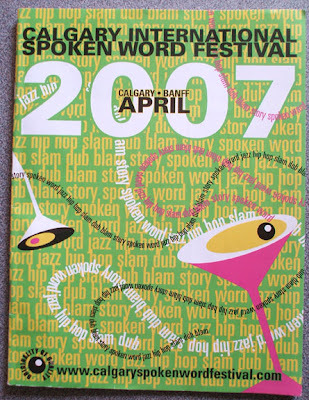 Inside this paper packet of carbon-based powders, fused with the energy or channelled heat of the sun, are pieces by spoken word artists gathered in Banff, Alberta, in April 2007, before the second gathering of [SWAN] Spoken Word Arts Network. 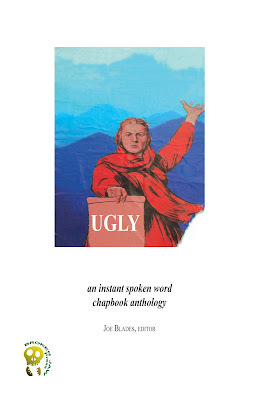 UGLY will be a limited-edition (first printing 100 copies), 40 page, saddle-stapled, digitally-printed chapbook with tan end-papers and a full-colour cover, ISBN 978-1-55391-063-3. Copies will be donated to the Paul D. Fleck Library and Archives @ The Banff Centre, and with the Legal Deposit Office of Library & Archives Canada. Copies will be available for $12 prepaid postage-paid purchase from the publisher, Broken Jaw Press, Box 596 Stn A, Fredericton NB E3B 5A6. Ooogghh. . . to get and walk off my fuzzy, thick head . . . Saturday afternoon. 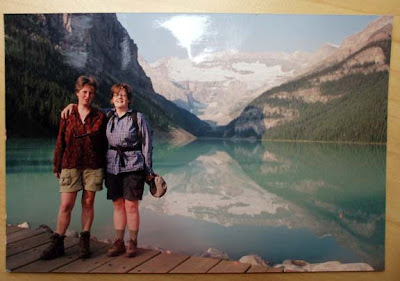 Once the laundry was dry and bagged on the bed, I walked outside past the Banff Centre staff accom buildings on the road to town, but only as far as the Hoodoo Trailhead. Didn't get to see Bow Falls but I did get to the banks of the river around the bend below the falls with the BS Hotel foregrounding Sulpher Mtn. Found a ribelk or mule deer, my guessmottled mossy green, brown and white, wedged amongst the rocks of a dry, pre-spring melt runoff, riverbed channel. I continued downriver on the trail that snaked tight between river and the base of Tunnel (nee "Sleeping Buffalo") Mtn. 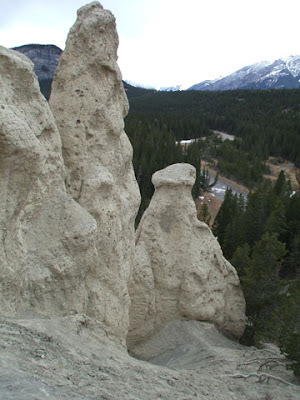 My walking goal, the Hoodoos: my first trek to them since living in Banff in the early '80s. Even then, I made it to them only once, and that time with a plastic 110 Kodak because my 35 mm SLR was in the repair shop. Never had good photos of the Hoodoos until today. I even went up close and personal to lay my hands on a Hoodoo and to take a few self-portraits with a Hoodoo backdrop. 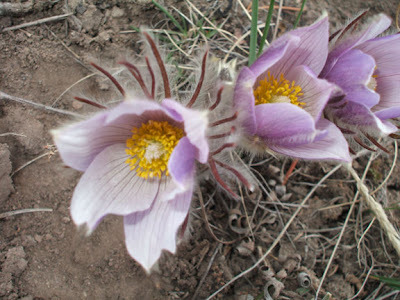 Hardy mountain crocus in bloom on a windswept, south-facing slope. 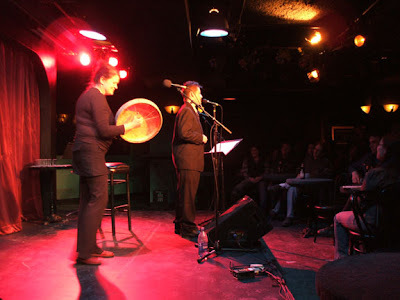 Above: cheryl l'hirondelle w/ drum accompanying Ivan E. Coyote during tonight's LOL reading, Calgary International Spoken Word Event @ The Club, The Banff Centre. Except for the terribly off-colour, even offensive, failed attempt at humour by the emcee, the real performers were all great. Outstanding! The spoken word artists performing here have all been outstanding. Next week there will be a new Broken Jaw Press publication on the table. UGLY will come out of this Spoken Word Arts Network [SWAN] residency group at the Banff Centre. Layout has been started. Two participants' work is already on their pages. The CIP data was applied for earlier this afternoon. ISBN 978-1-55391-063-3. The cover illustration is my riff on a sticker I collected ["Joe Bladesed", some would say] last year in Serbia. In Photoshop, I removed the Serbian text, and the sickle & hammer, from the sky and scroll. I love the socialist-worker-with-mountains-behind-him/her illustration. If all goes as discussed by the group of us, this chapbook anthology will feature spoken word textsprose, poetry and ?in English, Cree and Frenchby Andrea Thompson, Billeh Nickerson, cheryl l'hirondelle, D. Kimm, Drek Daa, Dwayne Morgan, Fortner Anderson, Hilary Peach, Ian Ferrier, Ivan E. Coyote, Kevin Matthews, Joe Blades, Klyde Broox, RC Weslowski, Sean McGarragle, Sheri-D Wilson and TL Cowan. Seems that we might also be working to make a compilation spoken word arts CD. 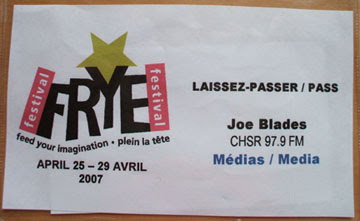 One produced/published in time for distribution to member station attending the National Campus and Community Radio Association/l’Association nationale des radios étudiantes et communautaires (NCRA/ANREC) 2007 conference to be hosted by CiUT in Vancouver in June. To be released by Ian Ferrier's Wired on Words out of Montreal. After the Poetry sPeaks show in The Club, the majority of us spoken wordies traipsed downhill to Props Pub. The multiple overtimes of the hockey game that Vancouver eventually won was on the big screen and regular TVs. I sat down with Ame Papatsie from Pangnirtung, Nunavut first. He's at Banff four months for that animation project. 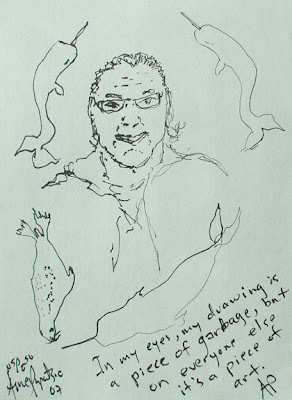 He asked for two pens then, with one pen in each hand, did this quick sketch of me surrounded by three narwhales and a harbour seal. Amazing technique to watch: both pens moving simultaneously. He said he's been drawing this way since he was a young child. 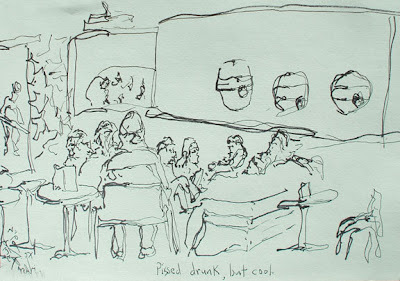 He then did this drawing of the pub scene with art [no, not art, but Big Rock beer plaques] on the wall, the hockey game beside it, and mostly spoken word artists. Ame also drew an Inuit drummer-dancer in my journal. Took a break from other stuff on the go, a non-scheduled day, and went to Marilyn Iwama's reading. I'd last seen her when we were in Lunsden at the Sage Hill Writing Experience. Marilyn lives in Wolfville, Nova Scotia. This aft we were a small yet interested audience of 10 listen to very new poems (the last one written as a letter to Rita Joe, unofficial poet laureate of the Mi'kmaq nation, since her death last month). Others were several years old but all in the same manuscript that Marilyn was her to complete. Now she has to find a good home for it. She knows of one prairie publisher interested in seeing a manuscript. With permission, I recorded her reading for future broadcast on Ashes, Paper & Beans. Many of the audience were Inuit artists here for their own residencies and projects including animation workshops in AfterEffects software. 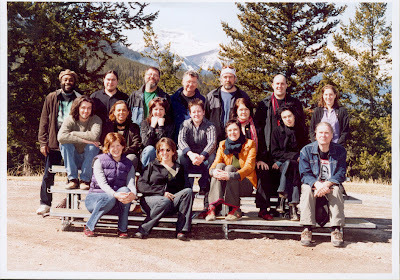 We were all given copies of a Banff Centre CD We Are Full Circle: an Aboriginal Women's Voices concert (2003). In the spirit of giving Inuit artist Ame Papatsie, then gave out copies of a recent (2006) carved-soapstone block print (edition of 25 on rag paper), titled "Foreward", of a hunter in kayak approaching a small iceberg. I shared some poem postcards . . .
Made my first version of this visual piece in 2003 after my last time @ The Banff Centre. It was published in The Fiddlehead journal and STANZAS 'zine (above/ground press). Minor revision on this revisit. Found inside the bottom of the headboard frame in room 2411, Lloyd Hall, The Banff Centre, Banff, AB, tonight about 10:30 pm. Two women on the shoreline boardwalk of Lake Louise. 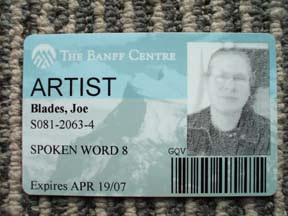 Possibly they were/or are artists that stayed here at The Banff Centre sometime in the past. T: Ruminator . 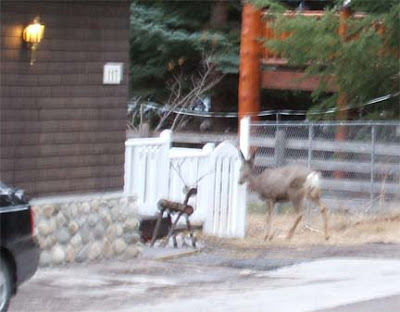 . .
Do mule deer understand log deer lawn ornaments, or are they simply confused, indifferent? 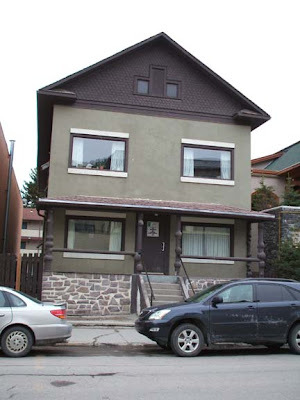 Acadia House on Bear Ave, Banff. 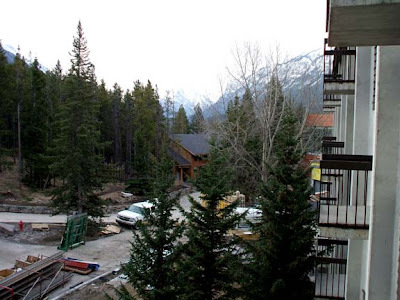 It's still a residence for some Banff Park Lodge employees. I lived there from May 1982-May 1983. On Friday the 13th, 1983, I hitchhiked east, my first artist journal in hand, heading towards a British Airways plane out of Mirabel for London, England and my first trip to the old world: four months in England, Wales, Scotland and Western Europe . . .
Getting there. 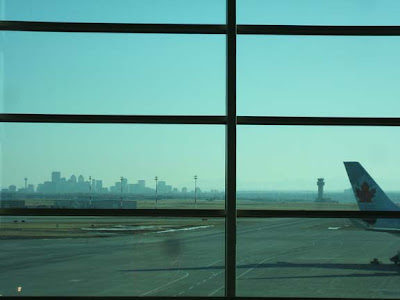 Calgary from the food court level of the airport late yesterday afternoon. Two hours in this limbo before catching the Airporter shuttle bus to the Banff Centre. Some time spent in Montana's Cookhouse having a steak sandwich and beer. Some of the view off my balcony this morning. Have a view of the length of Mt Rundle as well, its knife-edge peak obscured by a tall evergreen tree. This pic is of Goat Range and the side of Sulpher Mountain. Some some contruction happening at the Centre too. New dining room being built atop Sally Borden Rec Centre. Trucks and saws and grinders, rockbots landscaping. I will hear it as I'm keeping the balcony door open for cooler air. Turned the heat off in the room and it's still 23 C.
Now I'm validated as an artist again. Not just me making noise or meaningless somethings with things . . . Ten days of spooky spoken word work . 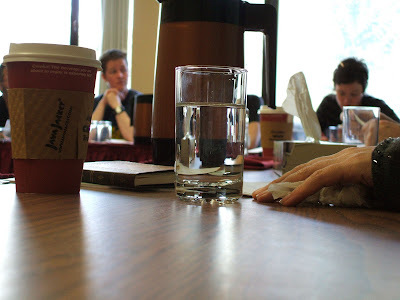 . . writing in my room, attending info sessions, meetings, workshops, reading-performances, doing the Banff Avenue shuffle, seeing mule deer and elk, geese, wild swans, tourists. Recording interviews and stuff including contributions to my slow-to-come-together "audible art project" (last artist recorded was Alexandra Flood on 14/09/05). Green ink all over my hands from a leaky pen, here I am . . .
Jo-Anne Elder, involves women writers and translators from New Brunswick’s English-speaking, Acadian and First Nations communities. The intention is to publish a collection of short literary pieces and works of visual art on the theme of women and community. 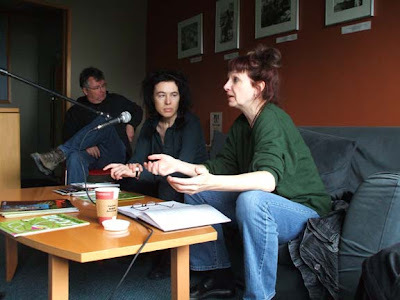 Community will be defined in a very broad sense, for instance in reference to the artist’s sense of place or “home,” the development and influences of other artists, her family or neighbourhood, creative work and community activism, urban or rural life, her conception of the linguistic, literary and cultural community or communities of New Brunswick, and creating woman's space in the community. We hope to present a range of perspectives on what it means to live in New Brunswick as a Maritime, Acadian or First Nations woman artist at the beginning of the twenty-first century. All of the writers, translators and artists involved will be women from New Brunswick. We envision short reflections accompanied by poetry or prose, which will appear in two or three languages (English and French, and in many cases Wolastoqiyik and/or Mi’kmaq), as well as visual works. Please submit a maximum of three pages of poetry or a short story under 1500 words for consideration of the jury, along with a reflection on the theme (approx. 250 words). editions ellipse appreciates the financial contribution of artsnb to this project. Feature of the show tonight was the live interview with UNB-Canada Council Writer-in-Residence Karen Soile.  "Lure" by Judy MacInnes Jr.
 Joe Blades interviewed poet Karen Solie including her reading of three poems"More Fun in the New World", "The Vandal Confesses", "Thrasher"from Modern and Normal (Brick Books).  "Sclérosi névrosa" par Geneviève Letarte.  poet Steve Luxton reading from Luna Moth (DC Books) @ the Atwater Library, Montreal.  "Pandore" par Mitsiko Miller. 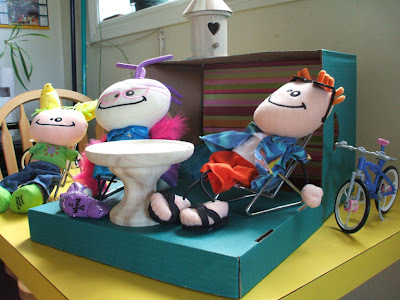  "Comfortably Canadian" by Officious Little Students. 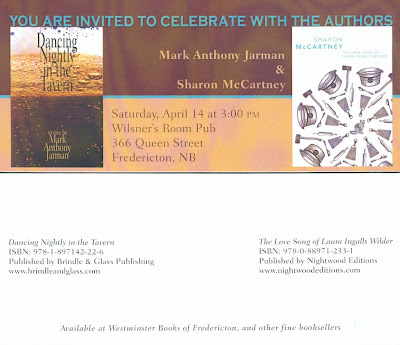  Fredericton Readings News, by Joe Blades. 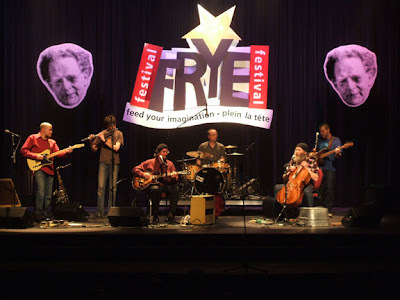  "Exploding Head Man (live)" by Ian Ferrier & Brio Trio. Here's a F'ton double book launch sure to draw a crowd (but I'll miss it, having said yes to being Banffed then). Mark Anthony Jarman & Sharon McCartney. Ran into Mark tonight at the juice store. His inside pocket stuffed with event postcards. 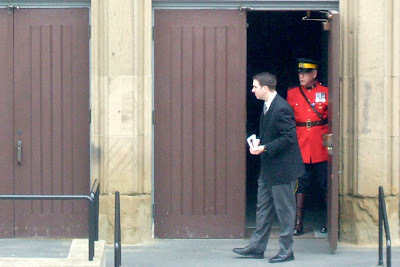 Mountie in full red dress uniform at the door of today's funeral. I've no idea whose funeral it is but . . . Here we go again: Incoming . . . In the style or pattern of my final days prep time for almost ever big travel-trip in recent years, this afternoon will be heavy chaos. In just a few hours I'll be receiving a shipment delivery of books from the distributor's contracted warehouse services facility in Georgetown, ON: two skids, 121 cartons, 1510 LBS; Daniel, the driver. "Maximum liability of $2.00/lb or $4.41/kg unless declared valuation states otherwise." My Feast of Fools V laundry is in the dryer. Over half of the kitchenware taken to Lindsay Valley Lodge is dry on the drainboard or back in its proper place. The rest is piled on the kitchen counter top to be dealt with once I have some time. The cover for ellipse 78 is ready to be sent to the printer. The revue/mag's guts will be close behind . . .
My studio space and living room will disappear (again). I've already dismantled the futon frame, and piled frame and futon atop the coffee table pushed tight to the wall. Stuff is layered inside the frame and table. My armour bags are piled atop the futon. The cartons from at least one skid will be piles there. The rest will likely end up in the office . . .
Across the street at Saint Paul's United, the Please / No Parking / Funeral and Funeral / Parking / Only signs are out and the first of the white vehicles from the son of Adam funeral home on another corner of my block are present. 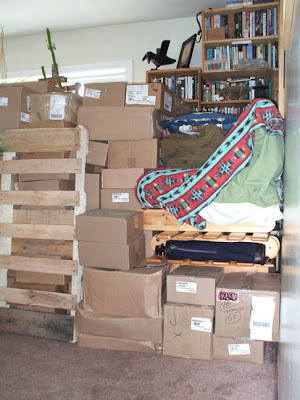 This week, or the last week of April I'll really be needing to look for warehouse storage in Fredericton . . . downtown or Fred Transit accessible, likely heated because it is book inventory, design and admin files to be stored there. It will cost but it could/should/will really clear a mess of broken work stuff out my living space. That will feel so good. The now broken studio as viewed from my front entry hallway. Isard helped with the load in. Thanks! A Barry Colpitts folk art crow is the overseer.